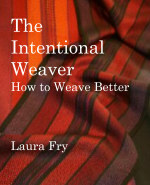 Weaving a Life: Here We Go Again! Olds Fibre Week, here we come! Well, soon. We will be staying in the condo unit, four of us sharing a kitchen. Problem is, the kitchen doesn’t have anything in it other than the standard stove, fridge and a microwave. So, in addition to this heap of student homework from last year, class materials and supplies and my personal stuff, I will be packing dishes, cutlery and some food staples. We will buy produce when we get there. What you can’t see in the photo are the small flat bed press, because wet finishing, and the portable warping valet. Which reminds me, I need to add warp packing for the group warp. Details, details! Several of my guild mates are attending this year, too, and will be promoting the ANWG conference we are hosting next year. The weather is supposed to be nicer tomorrow when we depart, as early as we can get going, but you never really know what the mountains will be like. It has been chilly and windy here and yesterday it rained a bit. So I’m hoping for a dry day for the drive.